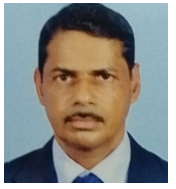 Promotion of public-private partnerships for extension delivery is the only way to bridge the demand for, and supply of, extension services among small tea holdings in Sri Lanka, argues Dr M.K.S.L.D. Amarathunga. Tea is one of the most important agricultural commodities in Sri Lanka that brings in a significant amount of export earning while generating employment opportunities for people in many districts. Even though its relative contribution has declined in recent years, the tea industry continues to occupy an important place in the economy of Sri Lanka. Productivity and the long term viability of tea smallholding lands have been declining due to many factors. One of the most significant lacuna in the tea sector has been the low level of adoption of proven technologies related to cultural practices arising from a lack of knowledge and non-availability of inputs at the correct time (Amarathunga and Wanigasundera 2018). The importance of an effective extension services in this regard cannot be over-emphasized (Samaraweera et al. 2013). Technology dissemination in the tea smallholding sector is in the hands of public and private parties operating through various channels. However, the public extension system in the tea sector is not expanding at the required rate to meet the increasing demand mainly due to financial constraints and inadequate manpower availability. 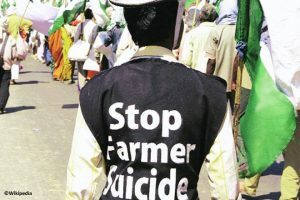 The field extension officer to farmer ratio is nearly 1:2700 when it should ideally be 1:1000. According to Obeysekera (2009), the extension coverage is extremely poor as the area under cultivation per extension worker is 814.85 ha. This shows the need for expansion of the TSHDA staff strength along with the need for more collaborative and partnership approaches to better serve the tea smallholders (Wanigasundera 2015). The extension arms of private organizations, such as agro-input and service agencies often operating through bought leaf factories, provide information that promotes increased use of their products (Amarathunga and Wanigasundera 2018). There is no proper organizational mechanism for monitoring and evaluation of the expanding private sector extension channels so as to ensure that the recommended technologies are effectively disseminated and used by smallholders. In order to find a solution for these limitations of technology transfer for tea smallholders, I developed a public-private partnership (PPP) extension model. All major stakeholders attached to this PPP model could engage in technology transfer in an integrated and cost effective manner. PPPs are increasingly being emphasized as a mechanism for improving public service provision and for implementing development programs. 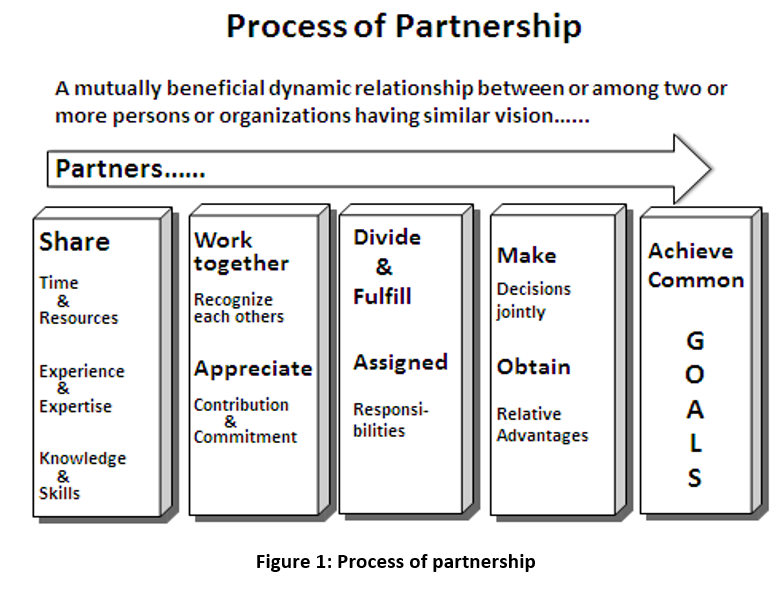 Conceptually, the partnership is an extended form of group dynamics where two or more parties establish relationships and leverage resources to work together with the expectation that each of the parties would achieve the greater goal than by working individually (Morse 1996) (Fig. 1). After applying the above concept to the technology dissemination process in the tea smallholdings sector, all key partners have to not only be working together and maintaining autonomy and independence, but also attaining their individual goals together with those of the other stakeholders in the sector. Partnership provides opportunities for all partners to learn new competence. The partnership also makes information available about the methods of accessing and using resources effectively. The Knowledge Generation System should initiate technology generation focusing on smallholder-specific problems, and also conduct adaptive field trials on smallholding fields at different locations prior to releasing a recommendation. All partners belonging to private and public sector in the technology dissemination process in the tea smallholdings sector, should have strong collaboration with each other and they would be willing to work together by sharing their experience. They will share resources while maintaining their autonomy and independence. In addition to dissemination of technology the PPP extension service should proactively work together for the distribution of inputs and services on time. Smallholders also should proactively participate in smallholder-specific technology generation by facilitating field-testing of new innovations on their lands, and record keeping. The internally developed public and private monitoring mechanism with the representation of all partners will drive the system efficiently and effectively, and reach the set targets within the scheduled time frame. With the active commitment and dedication of all the partners the developed mechanism is expected to facilitate the efficient and effective technology dissemination process to smallholders whilst addressing their field problems most appropriately. The model exhibited in Figure 2 on Public Private Partnership (PPP) extension was developed by me after conducting a comprehensive empirical study exploring existing collaborations among the key stakeholders of technology generation, dissemination and utilization systems. I also examined the factors affecting such linking mechanisms of extension and appraised the partners’ readiness for a public–private partnership (PPP) extension model for effective transfer of tea technologies to the tea smallholders. The aforementioned empirical study clearly illustrates sufficient evidence to prove that the adoption of proven technologies strongly depend on degree of interaction between smallholders and extension agents working in partnership. Therefore, I strongly recommend that all extension agencies develop higher levels of partnership and closer interaction among themselves and smallholders. 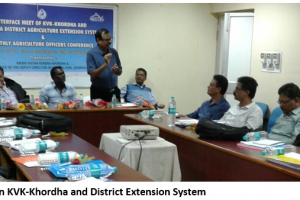 With the realization that top-down models of extension were failing to meet the needs of farmers, bottom-up models of extension emerged from the view that farmers wanted to be involved in research, development and the extension process. New models of extension are characterized by participatory involvement of many stakeholders in program planning, development and implementation. The partnership concept arose from the recognition that relationships between researchers, extension, farmers and industry, should be more actively integrated to develop effective extension programs. The Public Private Partnership model is now emerging as a possible solution to the problems pertaining to effective technology transfer, and is increasingly being emphasized as a mechanism for improving public service provision and for implementing development programs (Amarathunga and Wanigasundera 2018). 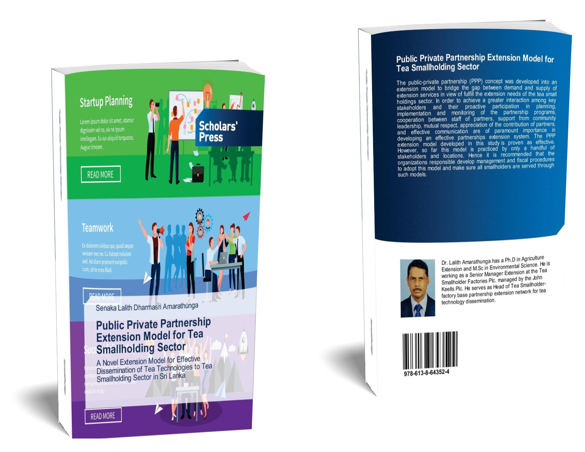 With the proven research findings derived from implementing the Public Private Partnership Extension Model for effective dissemination of tea technologies to the tea smallholding sector, the author proposes to apply the PPP concept in the following areas to fulfill the targeted goals. Productivity improvement of tea smallholder land by enhanced replanting programs through the tea factory-based Private Public Partnership Extension Channels. Example 1: Most of the tea factories have a field extension service to maintain the relationship between tea factory management and tea smallholders and they assist in improving productivity, and thereby the development of the tea smallholder’s livelihood. Example 2: Tea smallholder – Factory based partnership extension network of Tea Smallholder Factories Plc (private organization), has conducted a replanting project for productivity improvement of tea smallholding lands attached to the green leaf supply base of their factories since 2010. This project covers over 200 acres of tea lands under replanting with new cultivars and follows the standard good agricultural practices (GAP) recommended by the Tea Research Institute, and also with the collaboration of Tea Small Holder Development Authority (TSFL Annual Report 2017). Introduction of appropriate mechanization techniques to field practices through PPP Extension Channels. The tea industry faces an acute problem of labour shortage in field operations of the cultivation process. Most of the field operations, such as land preparation, harvesting, pruning, and weeding are labour intensive and manually done using the existing labour force at a higher cost. Given this scenario, in 2013 the Ministry of Plantations of Sri Lanka launched a project to popularize machinery in tea smallholdings. The total project budget is SLR 100 million and of this SLR 67.5 million has been allocated for awareness, training and supply of machines to selected smallholder societies and factories, while the remaining 32.5 million is earmarked for research and development of harvesting machines. The government has disbursed SLR 40 million and the Tea Research Institute (TRI) has launched a program to train tea smallholders in the use of new machinery under Phase I of the program. In the initial phase, 50 tea smallholder societies and 25 private tea factories have been selected for the project covering all tea growing regions. This project is being conducted in collaboration with both public sector (TRI, Tea commissioners division, Tea Smallholder Development Authority) and private sector (bought leaf tea factories, Tea societies, etc.). Transforming conventional technology dissemination methods into modern IT Smart methods through the PPP Extension Channels. The new models of extension proposed are characterized by participatory involvement of many stakeholders in program planning, development and implementation. It is encouraging to note that some advanced research and development studies have been recently undertaken to address the needs of extension services of the tea industry. The areas of study include: development of para-extension approaches and private-public partnerships to facilitate wider dissemination of technology, setting up of IT-based information and service delivery mechanism (Sidhakaran et al. 2014; Samansiri, Wanigasundera and Wijekoon 2014; Amarathunga 2015). IT-based mechanisms operate in both public and private organizations, tele communication channels, etc. These mechanisms will surely help in delivery of updated information to all relevant stakeholders – on forecasting of seasonal climate changes in tea growing areas, mitigation measures on pest and disease outbreaks, tea market updates etc. – and to get their feedback. Availability of effective and efficient analytical services for tea fields and on the manufacturing process through PPP Approaches. Analytical services related to tea cultivation and the manufacturing process is presently undertaken only by public institutions such as TRI and Tea Board Labs. However, the currently available mechanism is not capable of meeting tea growers’ demands due to limitations, chiefly of power, limited availability of new equipment, financial shortages, lack of coordination, etc. Availability of timely access to site-specific soil testing and nutrient management, coordination of inputs supply based on test reports, bio-chemical and residual analysis of different stages in the manufacturing process to ensure purity and cleanliness of the end product and so on – are all very important in providing efficient and effective services that meet the needs of stakeholders. Suitable private sector analytical service providers should be identified only after considering quality and standard of their services, timely availability, handling and capacity for wider coverage and capacity of analytical work, as well as their implementation of effective regulatory mechanisms through the involvement of relevant public organizations. 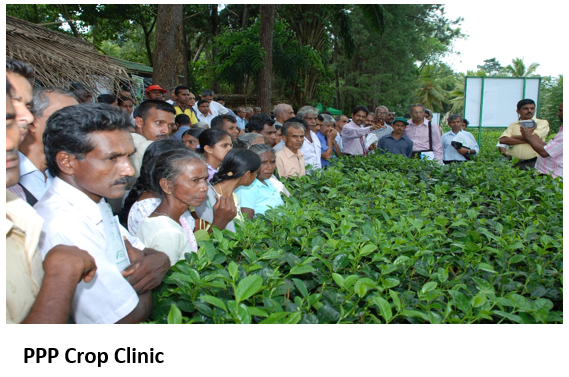 Establishment of an effective certification process for quality assurance of “Ceylon Tea” through the PPP Extension Channels “Sustainability” has now emerged, along with ecological concerns such as global warming, the greenhouse effect, carbon credits, energy efficiency, alternative and renewable energy, and environmentally friendly resources. These issues are now engaging the attention of the industry. Sensitive to these developments, it is actively addressing these issues – ranging from Good Agricultural and Manufacturing Practices, Technological Parameters and Social Responsibility to Logistics of the Value – 8 – Chain, Strategic Planning and Innovative Marketing Initiatives. However, the experiences and examples of the past stewards of the industry must not be trivialized in a misguided perception of progress. The dynamics of the future must be tempered by the morals, values, ethics and principles of the past. These values could be marketed in international business forums by the relevant public-private organizations through the establishment of effective certification processes (ISO 22000, Ethical partnership, Rainforest, GAPs and GMPs) that ensure the quality of “Ceylon Tea”. Opening up new avenues for value addition and product development through the PPP tea-related market-oriented channels. Tea exporters have now realized the difference between trading a commodity (black tea in bulk) and marketing a consumer product (value added tea in branded packs). Commodities are products that consumers cannot differentiate, one from another, as they all seem to serve the same need and deliver the same value. Consumer brands, in contrast, are distinguished through their compelling features that make one better than another in the product category. Ceylon tea will remain vulnerable to downward demand-led price pressure as long as it is treated as just a commodity. Sri Lanka is conscious of the need to bring about vertical integration in its traditional tea exports and is now converting a major portion of tea exports into consumer packs and other forms of value added exports, thus meeting the requirements of more sophisticated markets. Considering the need for long term sustainability in the tea sector, the National Plantation Industry Policy Framework (NPIP Framework-2006) means to focus on implementation of value addition and product development through building public-private and private-private partnership (PPP) approaches. 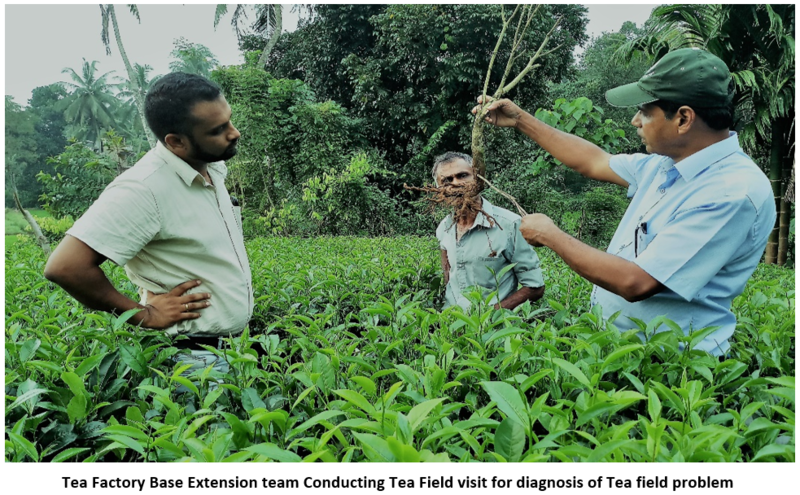 The Tea Research Institute of Sri Lanka has already identified new research areas and included these into their corporate research plan for the next five years. The focus is on development of value added tea products, such as improving the process for instant black tea production, optimizing the liquid tea-concentrate production process for commercialization, optimizing the alcoholic tea beverage production process for commercialization, optimizing polyphenol extraction from tea for commercialization, and extraction of protein from spent tea leaves. Opening up new lobbies for promotion of brand name – “Pure Ceylon Tea” – by marketing of heath aspects via PPP tea-related market-oriented channels. Product differentiation, cost leadership, niche marketing, branding and customer focus were accepted as the strategies that need to be adopted by most of the firms. In addition, each firm had its own set of strategies, which differentiate it from others and offer competitive advantage over its competitors. Some of these specific strategies include fair trade, environment sustainability, strategic partnerships, outreach, market diversification and quick delivery. The firms have introduced new products into the market as well as extended the existing product range according to growing market demands. Opening up new markets abroad has been an important strategy that placed these firms among the market leaders. When the tea’s sales values are considered, it is apparent that the firms that have outperformed their competitors in sales have adopted customer focus as a common strategy. For instance, the health tea segment was selected due to the strong demand predicted and triggered by a health trend that is an ongoing craze in Scandinavia. The product planned is a green tea containing Scandinavian herbs, as Danish people tend to prefer local products. The brand name is Healthé, the packaging shows a cartoon, and the tea is packaged as tea bags. Healthé is positioned within the lifestyle segment with ‘healthy lifestyle’ seen as its main driver. The key attributes of the product will embody the Scandinavian traits of being energetic, healthy and happy. To promote the product an integrated marketing communication plan will be implemented. The promotion of the product will be with Global worming potentials (GWP´s) and not discounts, as Healthé is a premium product. Health and wellness trends boost the total volume sales of green tea and other fruit/herbal teas in Denmark. Green tea is the best performing major category in tea in terms of retail volume and retail value growth – with growth of 3% and of 7%, respectively, for 2010 and 2011 (Euromonitor International 2013). Black tea suffered a decline due to the good performance of green tea and fruit/herbal tea (Euromonitor International 2012). Opening up new avenues for development of tea culture and promotion of “Tea eco-tourism” locally and internationally through PPP tea-related market-oriented channels. Most tea plantations are located in the central mountains of the country. These areas are rich in biodiversity, and attracts tourists with its natural beauty, waterfalls, rivers, and architecture, etc. These locations have more potential to improve eco-tourism. Furthermore, there is great potential to promote Sri Lanka’s tea culture by highlighting historic events, tradition, cultural values, along with a tea story that follows each step in the cultivation and manufacturing process, value addition, and product development and diversification, etc. Therefore, effective mechanisms must be established by linking relevant public–private organizations to explore all potential avenues for improving tea-related eco-tourism. These must transcend politics and personalities and be formalized as much as possible by using proven mechanisms within, and between, each level of government and between the public and private sectors. The Public-Private Partnership model in tea has significantly improved the adoption of important field practices in tea production, which is directly leading to enhanced productivity of tea smallholding land and its long-term sustainability. In order to achieve greater interaction among key stakeholders it is necessary to engage their proactive participation in planning, implementation and monitoring of the partnership programs. Cooperation between the staff of partners, support from community leadership, mutual respect, appreciation of the contribution of all partners, and effective communication are of paramount importance in maintaining an effective partnership extension system. Organizations involved in the tea sector should now develop appropriate mechanisms and fiscal procedures to adopt this model and thus make sure that all smallholders are served effectively. Amarathunga MKSLD. 2015. 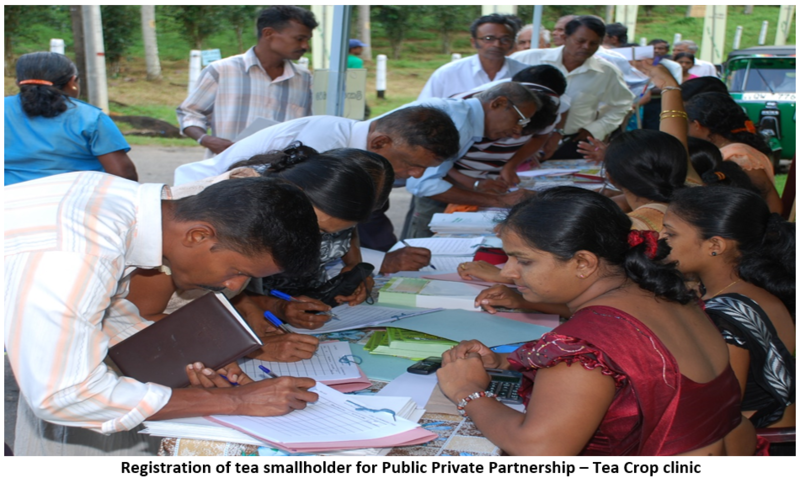 Development of a private-public partnership extension approach for the effective dissemination of tea technologies to the tea smallholdings sector in Sri Lanka. PhD Thesis. Postgraduate Institute of Agriculture, University of Peradeniya. Amarathunga MKSLD and Wanigasundera WADP. 2018. 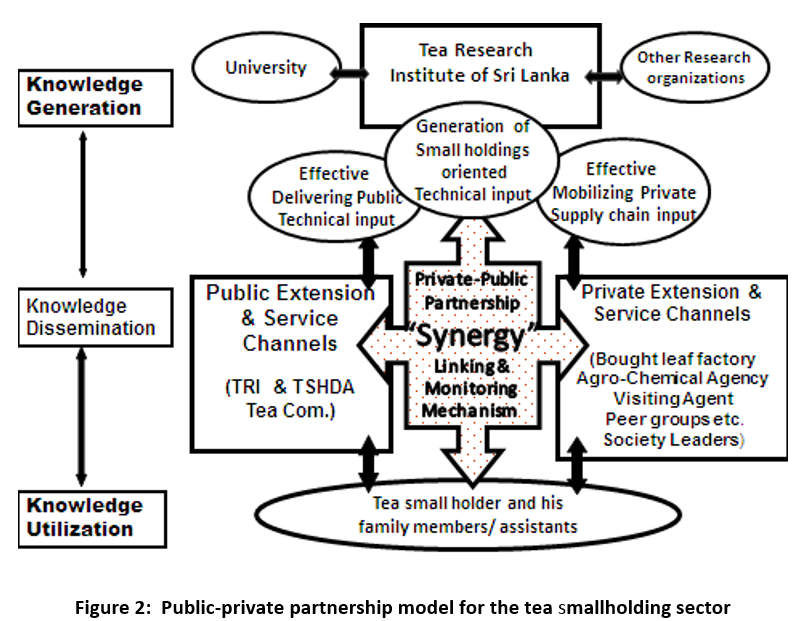 Application of public-private partnership extension model for effective dissemination of productivity improvement technologies for tea smallholding sector in Sri Lanka. Pages 19-28 in Proceedings of the National Symposium on Sustainable Plantation Management-2018. Colombo: National Institute of Plantations Management Symposium. Obeysekera KGB. 2009. 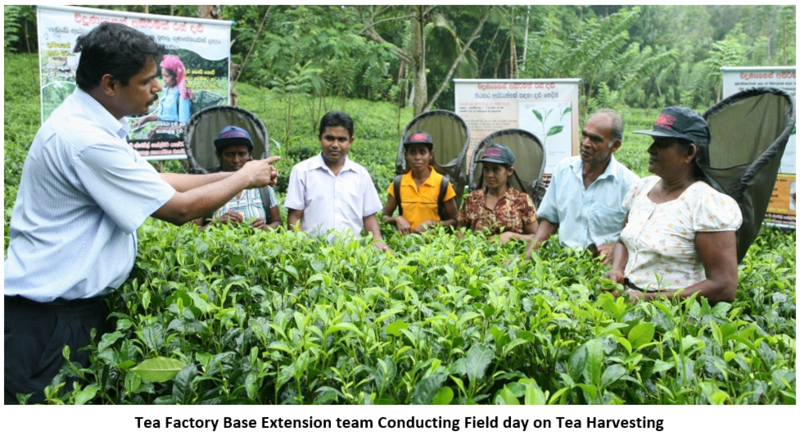 Agricultural extension in the tea smallholdings sector in Sri Lanka. In: Experiences and challenges in agricultural extension: Meeting farmer needs (C. Sivayoganathan ed.). Proceedings of Agricultural Extension Conference 2009. Peradeniya, Sri Lanka: Sri Lanka Agricultural Extension Association. Rajasinghe JCK and Samansiri BAD. 2014. Evolvement of agricultural extension in Tea Research Institute and present applications. In: Agricultural extension recent interventions for development in Sri Lanka ( Wijeratne M and Mahaliyanaarachchi RP eds.). Peradeniya, Sri Lanka: Sri Lanka Agricultural Extension Association. ISBN 978 9550198 01 6. Samansiri BAD, Wanigasundera WADP and Wijekoon Rohan. 2014. Information seeking behaviour and the use of ICT by the plantation managers of the corporate sector tea plantations in Sri Lanka. “Towards a Green Plantation Economy” – The Fifth Symposium on Plantation Crop Research. Uda Walawe, Sri Lanka: Sugarcane Research Institute. Samaraweera GC, Qing Ping and Li Yanjun. 2013. Promoting tea business in the tea smallholding sector in developing countries through efficient technology transfer system: Special reference to Sri Lanka. African Journal of Business Management 7(22):2186-2194. Sidhakaran VS, Seevaratnam DV, Nishanthi MAH and Kumara ALRU. 2014. Para extension approach as a novel technology transfer model for tea plantations and its effectiveness. “Towards a Green Plantation Economy” – The Fifth Symposium on Plantation Crop Research. Uda Walawe, Sri Lanka: Sugarcane Research Institute. Sri Lanka Tea Board. 2017. Tea Market Update 11(1). Tea Promotion Bureau of Sri Lanka Tea Board. Tea Research Institute of Sri Lanka. 2002. Tea VP cultivar recommendations for low country. Pages 42-44 in Technical Report of the Tea Research Institute for 2002. Tea smallholder Factories PLC. 2017. Annual Report of the Tea smallholder Factories PLC for the financial year of 2017-2018. Pp. 3-8. Tea Smallholdings Development Authority. 2017. Annual Report of the Tea Smallholdings Development Authority, 2012. Pp. 5-7. Congratulations AESA, for reaching milestone of 100 blogs. I fondly remember writing the very first blog and contributing 10 blogs in total I guess. This blog too as usual very well written on an important issue like public private partnership in delivery of extension services. Congratulations to Dr Amarathunga for this excellent contribution from Sri Lanka.